The visionary CEO didn't have enough faith in Apple's future. 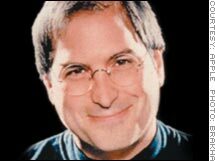 (Fortune Magazine) -- Did Steve Jobs backdate the options he got as Apple's CEO? I doubt it, based on the evidence I've seen, though the company admits it backdated some other employees' options. Seems to me what he really did with his options was probably legal - and incredibly dumb for a guy who was making Apple one of the all-time great business turnarounds and America's seventh-most admired company. The great seer of tech trends had no idea what was coming - indeed, no idea how much his company, or he himself, was really worth. Larger question for investors: If he didn't know, how could the rest of us? Here's what happened. When Fortune ran a 2001 cover story (by yours truly) called "The Great CEO Pay Heist", we put Jobs on the cover because the previous year he had received a mammoth grant of stock options that we calculated was worth $872 million, making it the largest one-year pay package any CEO had ever received. Jobs responded with a letter to the editor, which we published, saying we had made a "glaring error." Those options weren't worth anywhere near what we said. "In fact, they are worth zero," he stated, since they were underwater. And he went further: "If I'm in error, and you really do think my penniless stock options are worth $872 million, I will be pleased to offer you the deal of a lifetime and sell them to you for just half that amount. And I also have a bridge you may be interested in buying." We answered that while his offer was "potentially a good deal, Fortune isn't sufficiently capitalized at present to take advantage." Jobs wasn't ready to give up on Apple options, though; he accepted another huge grant in 2001. Then, in 2003, with Apple (Charts) stock deep in the doldrums, he finally abandoned hope and surrendered both options grants, accepting from the board in their place a big chunk of restricted stock. And with that, the matter was largely forgotten until the recent backdating mess brought it all back. Now, with benefit of hindsight, let's get out the calculator and see how smart Jobs looks. That bag of restricted stock he got in 2003 is today worth about $848 million. Not bad. But what about the options he gave up? His first mega-grant, the one that landed him on our cover, would today be in the money not by the $436 million for which he offered to sell it to us, or even by the $872 million we said it was worth, but by just over $2.5 billion. * The supremely self-confident aren't always what they seem. Though Jobs is considered one of Silicon Valley's leading egomaniacs, which is saying something, he had virtually no faith in his own abilities. When he wrote us that letter, he knew something the rest of the world didn't: that in a few months he would stand on a stage and introduce a new product called the iPod. Yet he not only insisted his options were worthless but put his money where his mouth was two years later and made a trade that will be immortalized as one of the worst ever. * Rationally reading a CEO's behavior isn't always the right investment strategy. Jobs was sending the market powerfully negative signals. After all, when he wrote us the letter, those options still had almost nine years to run. It was easy to calculate that if Apple stock simply appreciated for the options' ten-year term at the same moderate rate as over the previous ten years, the options would have been worth far more than we said. Thus, Jobs was telling the world he didn't expect that to happen. Exchanging his options for restricted stock sent the same message. The rational response - to sell - would have been exactly wrong. So be cautious in analyzing Jobs' newest pay data, to be revealed in a proxy statement due out around the time you're reading this or soon thereafter. Remember that Jobs likes maverick pay deals. His salary is $1 a year, and in 1999 his bonus was a Gulfstream V jet. * Smart-aleck journalists aren't always smart. "Fortune isn't sufficiently capitalized at present" was a lame excuse. We should have hocked the office furniture, broken our kids' piggy banks, and taken the deal.